There have been a number of musical 'Road to Damascus' experiences in my life. I have heard one particular piece of music or performer that has led me to want to hear and find out as much as I can about a particular genre and it's usually been traditional music. Hearing a Johnny Dodds recording in a second-hand record shop whilst I was still at school led to several years of fixation with authentic New Orleans jazz. Listening to Jeannie Robertson for the first time at a Keele Folk Festival led to a lifetime interest in Scots travellers singers. Similar experiences have enabled me to develop interest in the traditional music of Romanian gypsies and the Hungarian-speaking communities in that country and, amongst others, the music of Bretons and Zulus. It was at a boot sale that I bought an unplayed LP for 50p; Direct from West Africa by Jali Musa Jawara. It was and still is wonderful. In retrospect, it may seem a bit westernised and easily accessible, but this album opened many more doors for me and soon I was buying West African albums by the score. However, the best musical experience has always been listening to musicians live and hearing traditional music played in its context is the mightiest of these. 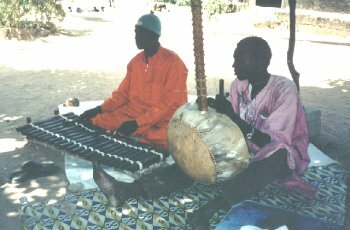 So it was that Tina and I booked a holiday in the Gambia; no contacts or addresses, just the feeling that if we followed our noses and our instincts, we would find good traditional music. And we did, once we found our feet. Forget all that guff about the world now being a 'Global Village' and everywhere is now the same. Well, perhaps it is, if you drift from hotel to hotel - but go out on your own in a Third World country for the first time and there are some massive culture shocks awaiting you, mostly in coming to terms with the grinding poverty in which people live out their lives. It was during our second visit to the Gambia, that we first had that heaven-on-earth experience of sitting under a mango tree listening, with the large extended family that make up the residents of a compound, to kora and balafon playing. You might have thought that it would be easy to find contacts for a member of one of the most famous griot families. 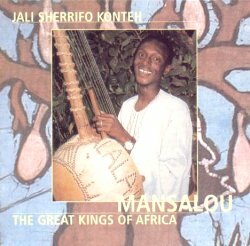 He is the son of Alhaji Bai Konte, the first kora player to have an album recorded in Europe (Kora Melodies from the Republic of the Gambia released on LP by Virgin in 1973 and now re-released on CD by Rounder). He is the brother of Dembo Konte who has toured Europe extensively and even recorded with the editor of these pages as a member of Orchestra Super Moth! Well, not so. What is needed to get anywhere these days is a recording that can be used for promotion. This is not as easy in the Gambia as it is in Britain; studios, portable recording equipment, money for such projects, are all non-existent. We decided to go out again and record him ourselves. 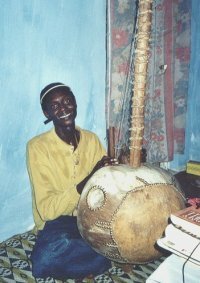 We thought that the best place to catch Sherrifo playing at his best would be in his own room in his compound in Brikama. When would be the best time? Well, life and play in the compound would have to go on; the quietest times would be during the sweltering afternoons. This made conditions for recording somewhat different from the BBC studios that I had been used to in the South of England. The heat made things pretty unpleasant physically, but my main concerns was whether my equipment (portable minidisk recorder) would function at temperatures way above what the operating manual recommended. Plied with mint tea after each take by his younger brothers and with frequent respites under the mango tree, we realised that something quite special was happening. Sherrifo was clearly putting his heart and soul into these performances and had carefully thought out a good variety of his repertoire encompassing contrasting moods in his singing and using different tunings on the kora. We only had simple earphones with us and so it was not until we got back to England that we were able to play them through a proper system and realise to our relief that we our recordings were of a quality to capture the excellence of his performances. Our initial plans had been to make a few CD-Rs of the edited recordings to distribute to people who might be able to help to promote him, but this soon seemed to be unworthy of what he had performed for us; a properly designed and produced CD was what the recordings deserved. The next job and a difficult one for us is to sell them. There will be a review appearing elsewhere on this site. As I write this I realise how difficult it is for me to heap praise on something that I am involved in. I can only say that producing this CD, listening to Sherrifo's music, the friendship that he and the many others have shown us in the Gambia in the last few years and the great times that we have had there have been life-enriching experiences for us. It's about time that we started to pay something back. Needless to say, we don't look to make a penny from this project. We have been able to keep production costs to a minimum, talking professionals involved into giving their services free so that the profits that go to the musicians in the Gambia can be maximised. The price of one CD is more than the average Gambian earns in a week.